Charles Dickens’s A Christmas Carol is one of the most beloved holiday stories of all time, and The Man Who Invented Christmas delves into the story behind the story, dramatizing the author’s mad dash to get the book finished in a matter of weeks. The film transports us back to Victorian England circa October, 1843. Following several flops, Charles Dickens (Dan Stevens) is desperate for another hit, needing the money to pay his bills and wanting to get back on top of the literary world. Fresh out of ideas, he finally settles on writing a Christmas book, with a ghostly narrative inspired by a spooky old Irish folk tale that he overhears his young housemaid Tara (Anna Murphy) telling his kids. But his publisher isn’t interested in putting out a Christmas story, so Charles Dickens decides to go the route of paying for and publishing it himself, hoping to have the book in stores before the holiday, which is just two months away. All the while, he is dealing with the unexpected news that his wife (Morfydd Clark) is pregnant with their fifth child, and the arrival of his well-meaning but overbearing parents (Jonathan Pryce and Ger Ryan) as surprise house guests, which keeps taking him out of his work. But he is determined to complete the manuscript, send it off to have it illustrated and printed in a matter of days, and get it on store shelves, with the Christmas deadline inching ever closer. The fact that we obviously already know he is going to pull it off doesn’t diminish any of the pleasures of this highly enjoyable film. As we all know, A Christmas Carol instantly became a beloved holiday classic that still endures to this day, but what’s even more interesting is how the book served to cement Christmas as a major holiday in England, at a time when it was seen more as a religious observance than a major celebration. The book helped to establish some of the many traditions that have become customary for the season. The story was able to foster a spirit of “peace on earth and goodwill toward men,” by shining a much needed light on the disparity of the poor and working class during the Industrial Revolution, and inspiring those with wealth to think about and give back to those in need. The film depicts Charles Dickens as a somewhat manic writer, trying to get work done with constant distractions happening in the house around him, often snapping at his family, and anyone who has ever struggled with writer’s block will recognize the wayward look that he gets in his eyes when staring at a blank page. He frantically paces around his room, often muttering to himself, and conversing with imagined versions of the characters he is writing, with the old miser Ebenezer Scrooge (Christopher Plummer) appearing to him and serving to both inspire and torment the author. The story provides some interesting parallels between Dickens and Scrooge, as they are both taken on a journey that helps them overcome moments of selfishness and become better men. Through this, The Man Who Invented Christmas also works as a clever new adaptation of A Christmas Carol. There are a lot of fun nods to the work of Charles Dickens, and the obviousness of some of the references is offset by the often winking way that the film works them in. The author “collects names,” and many of the people he encounters end up inspiring characters in his book and reappearing to him as he writes, with the ghosts inspired by people he knows or encounters, and some of the book’s classic lines being culled from real conversations he has and things he overhears. Whether all of this is true or if parts of it are somewhat apocryphal doesn’t really matter, because The Man Who Invented Christmas makes for one heck of a good story either way. Directed by Bharat Nalluri, and based on Les Standiford’s nonfiction book The Man Who Invented Christmas: How Charles Dickens’s A Christmas Carol Rescued His Career and Revived Our Holiday Spirits, which has been adapted for the screen by Canadian actress and writer Susan Coyne, this is an attractively mounted period piece that is filled with many delights. The production sometimes has bit of a stagey feel to it, but this actually adds to its charm. The Victorian costumes and backdrops are a real treat to watch, with the wintry streets of old fashioned London instantly evoking a sense of Christmas spirit. Dan Stevens carries the film with an energetic and highly watchable performance, and Christopher Plummer makes a fitting foil for him, delivering an excellent take on Scrooge. They are backed up by a uniformly solid ensemble cast. The film delivers its most emotionally charged moments in the last act, when Charles Dickens has to finally confront his own personal ghosts and childhood traumas in order to finish A Christmas Carol, before reaching an epiphany that leads him to make amends, in a way that recalls the final moments of the story he is writing. I have a deep personal love for A Christmas Carol, and I always take note when a new version of the story comes out, so The Man Who Invented Christmas held instant appeal for me, and it captures the spirit of the work in an authentic way. 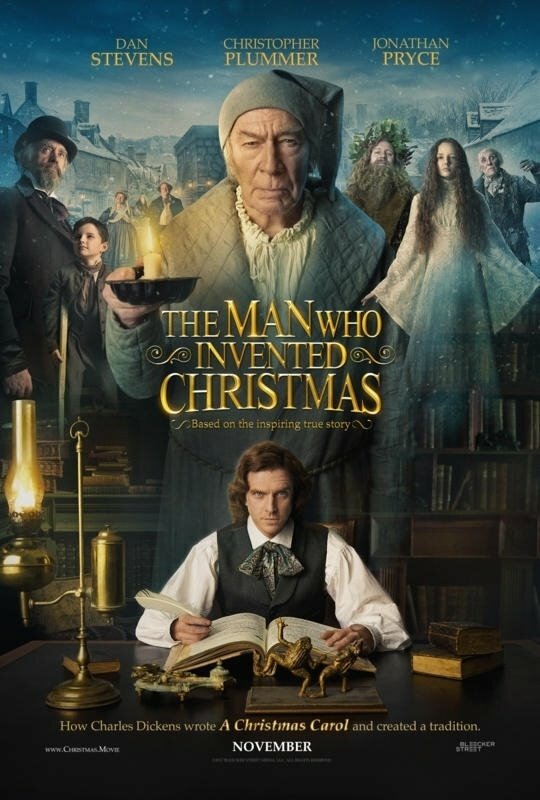 This is an engaging look at the writing process, that functions as both a biopic of Charles Dickens and an inventive retelling of what is perhaps his most beloved story, providing a breezy and entertaining feel good film that is made to be enjoyed around the holidays.